I’m so excited to share with DIY communication journal idea (with free printable prompts) with you today as part of a shop that has been compensated by Collective Bias, Inc. and its advertiser. All opinions are mine alone. #PowerToThePen #MyGo2Pen #CollectiveBias Back-to-school time is almost upon us here! 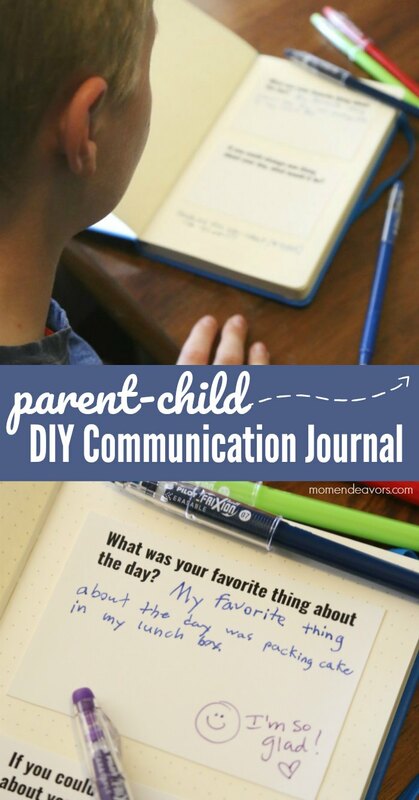 And one thing we’ll be continuing again is our parent-child communication journaling that we started last year! These boys of mine (11, 8, 6) aren’t very talkative about their day or what’s going on at school! Then last year, Big Brother had an issue at school that wasn’t shared with us (and it needed to be). So, I decided to start doing a journal with him in hopes of opening some different channels of communication. And it was a success! He seemed to really enjoy doing it. That especially showed if there was a day I forgot to have the journal ready when he got home as he would bring the journal to me as a reminder! 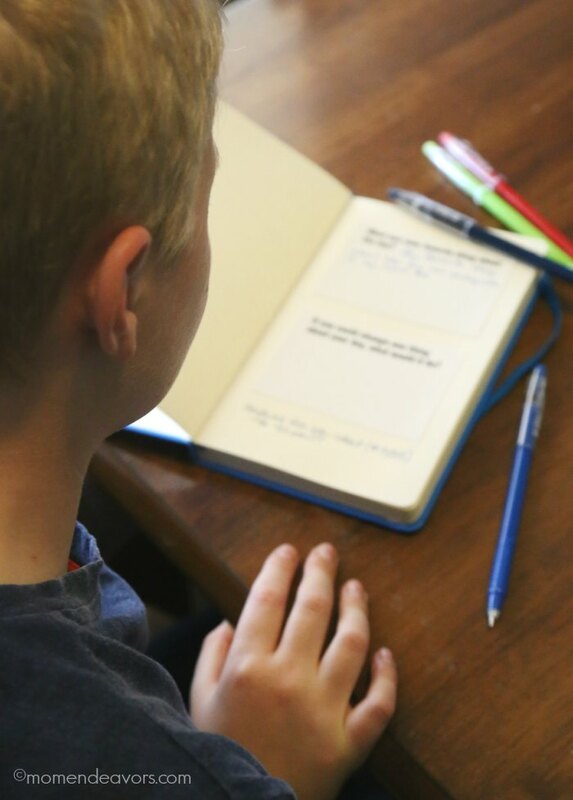 Basically the journal has a couple of questions each day for him to answer (and he can ask us questions too). Then, I can respond right there in the journal. Here’s an example entry (from his birthday): Awww, love!! 🙂 I packed him a little cake in his lunch box and it was his favorite thing about his day. I love having these open-ended questions and then being able to write him little notes back! As we head into those sometimes hard, awkward, quiet teen years, I think this practice is going to be invaluable as it certainly was valuable even at ages 10/11. 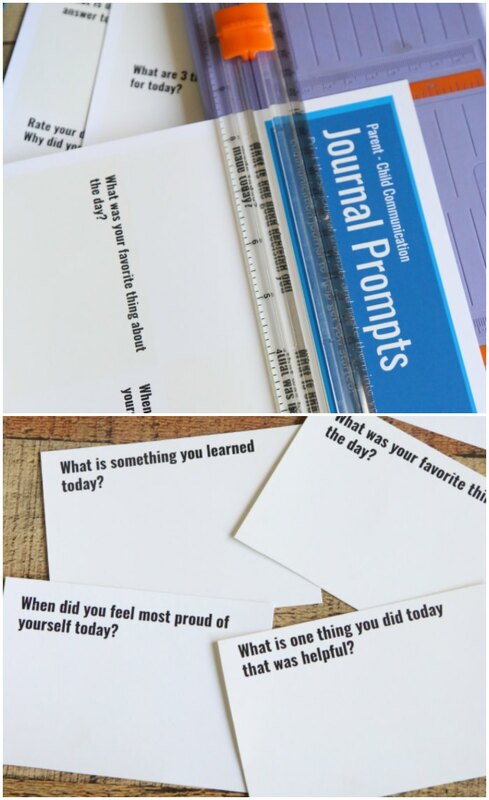 So, I’m sharing a few tips and free printable prompts to get you started! 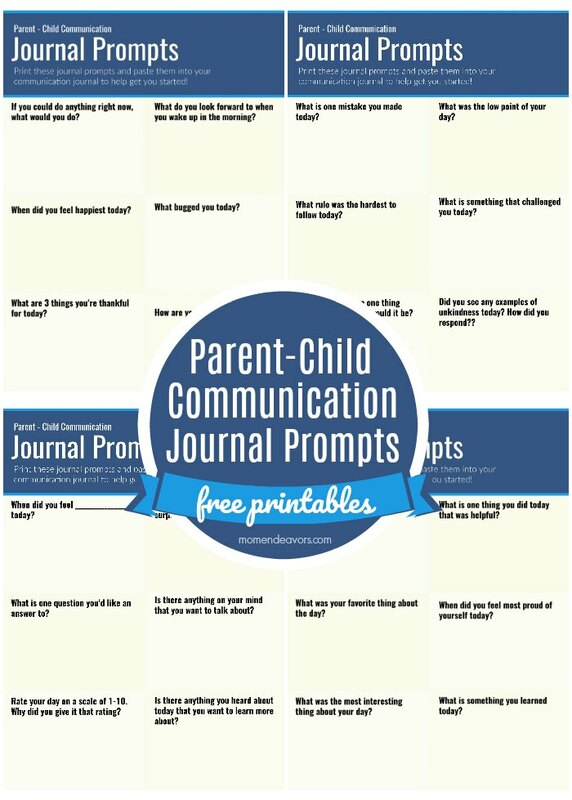 Once you’ve decided on the journal, gather a list of prompts or print out the sheets below. I have 4 sheets to get you started, each with 6 different questions/prompts. You’ll find a variety of questions like “When did you feel happiest today?“, “What is one mistake you made today?“, “What is one question you want an answer to?“, etc. I like to vary the types of questions I ask each day so it doesn’t get too monotonous (or look like I’m constantly after the same information). So, print these sheets as desired. Just click to download any (or all) of the sheets listed below, then print! I recommend a higher/photo quality setting for best results! Once you have your prompts printed, you can cut them out to have ready to go. 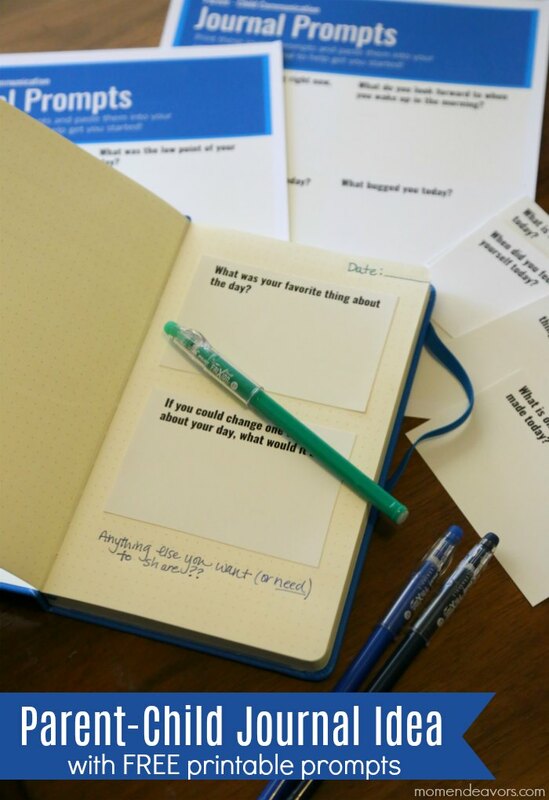 I don’t recommend putting in the journal ahead of time, as you might feel like certain questions need to be asked on certain days or depending on how that particular day is going. 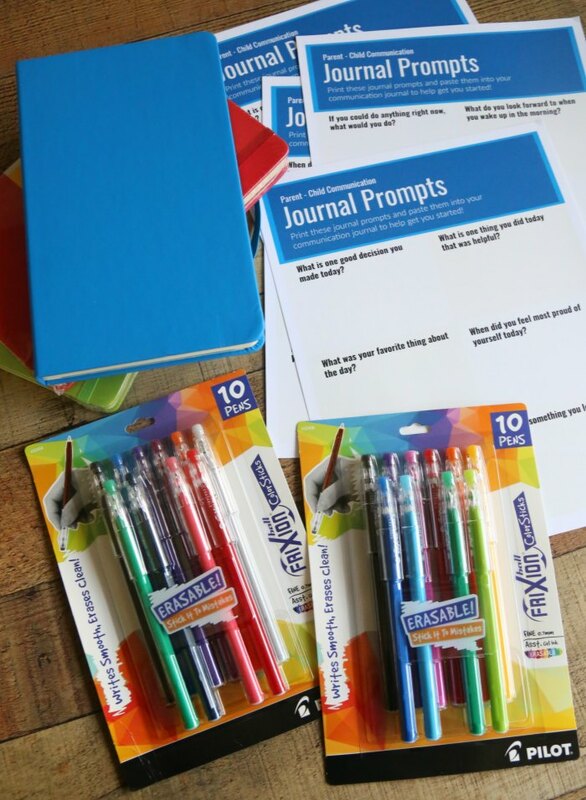 So, have a stack at the ready and glue into the journal when you want to use them! Once you have all that in place, decide on a place where the journal will “live” and put some fun, colored pens with it! We all LOVE the FriXion® Pens here! 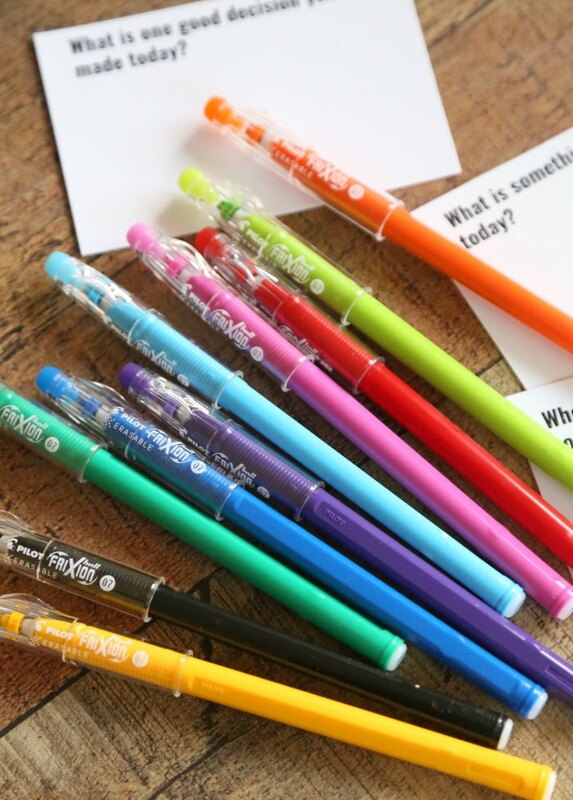 Not only do they come in fun colors and write smoothly with gel ink, but they are erasable. ERASABLE PENS!!!! Yes it’s true…the former teacher in me rejoices!! 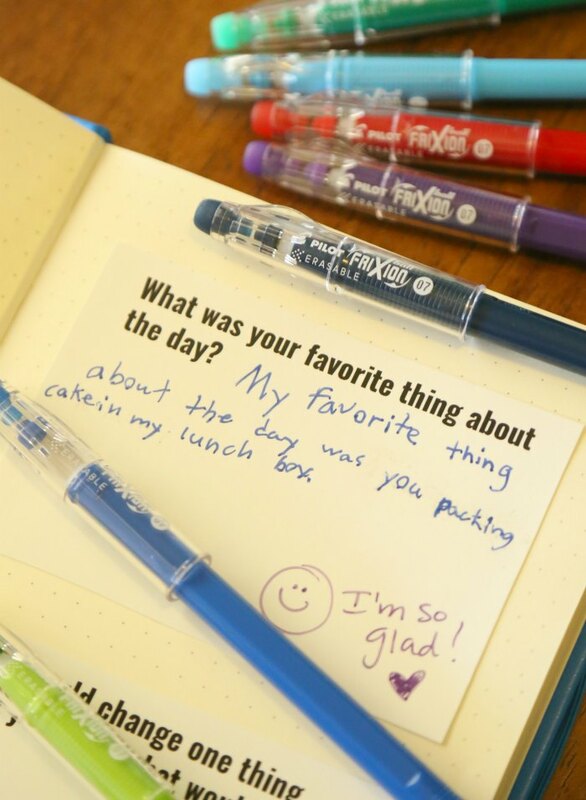 With the FriXion® Pens, we can all write smoothly AND erase cleanly…which is great for journaling! In fact, in that journal entry photo above, Big Brother erased and rewrote part of his sentence and I bet you didn’t even notice! SO good! 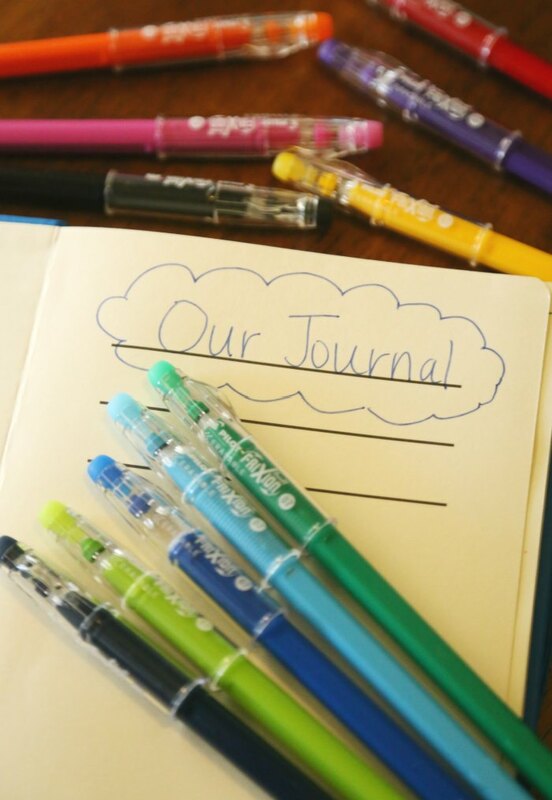 So, when you’re shopping for back-to-school supplies, consider picking up a journal and some FriXion® Pens to start a new journaling routine with your kids during the school year! I grabbed a new journal and the pens at Walmart this year! 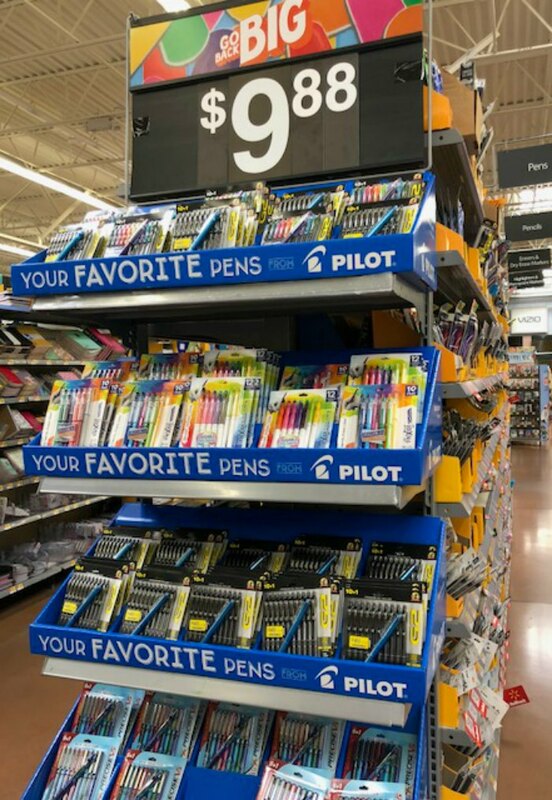 There was a whole Pilot Pen end cap display featuring a variety of great options, including FriXion Clicker, ColorSticks and Colors Marker Pens! Visit Walmart to see all your choices! Happy Journaling!! !